Motivated by Mahatma Gandhi’s famous quote “you must be the change you wish to see in the world,” Trenton-based artist collective and non-profit organization S.A.G.E. 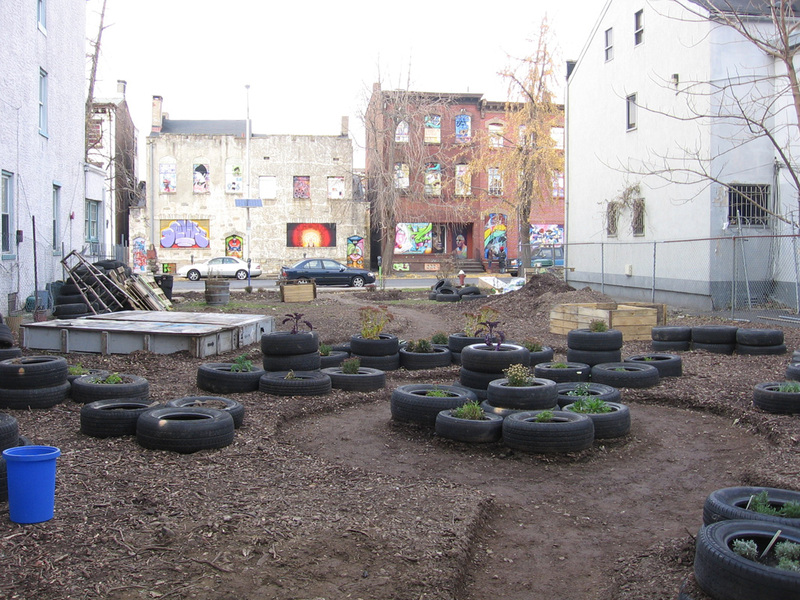 Coalition (“Styles Advancing Graffiti’s Evolution”) transformed an abandoned lot next to their artist studio into a community garden. The most prominent artwork in the garden is its namesake, the mural of Mahatma Gandhi painted by Will Kasso. All of the artwork in the Gandhi Garden helps contribute to the garden’s goals of neighborhood beautification, use of local and recyclable materials, and extension of the artists’ studios into the outdoor space. The S.A.G.E. Coalition began clearing the lot as part of their annual Windows of Soul event, a three-day-long block party and street revitalization of East Hanover Street. As part of the beautification efforts, volunteers cut the overgrown grass in the abandoned lot and uncovered an old mural of Mahatma Gandhi painted by S.A.G.E. Coalition founder Will “Kasso” Condry. This mural, along with Gandhi’s famous quote, inspired the creation of the Gandhi Garden. While S.A.G.E. 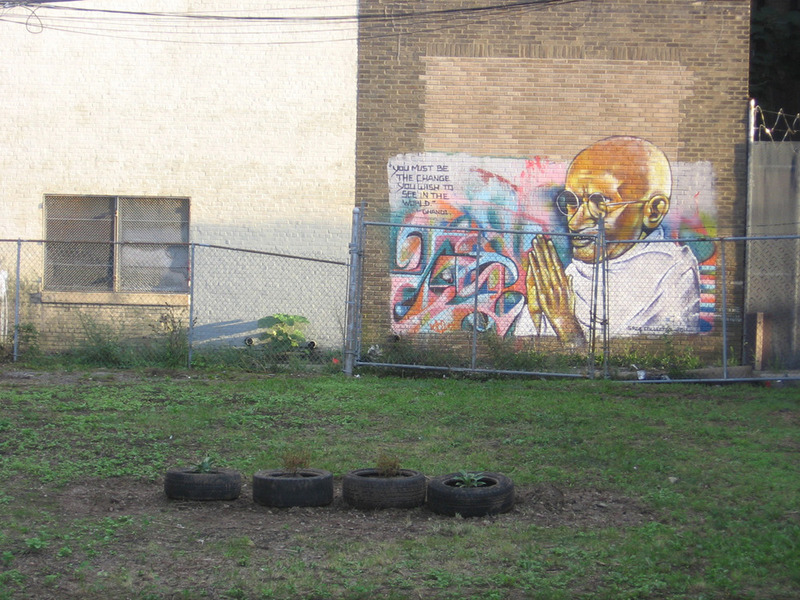 Coalition built the garden, Kasso painted over the original Gandhi mural with a new version. 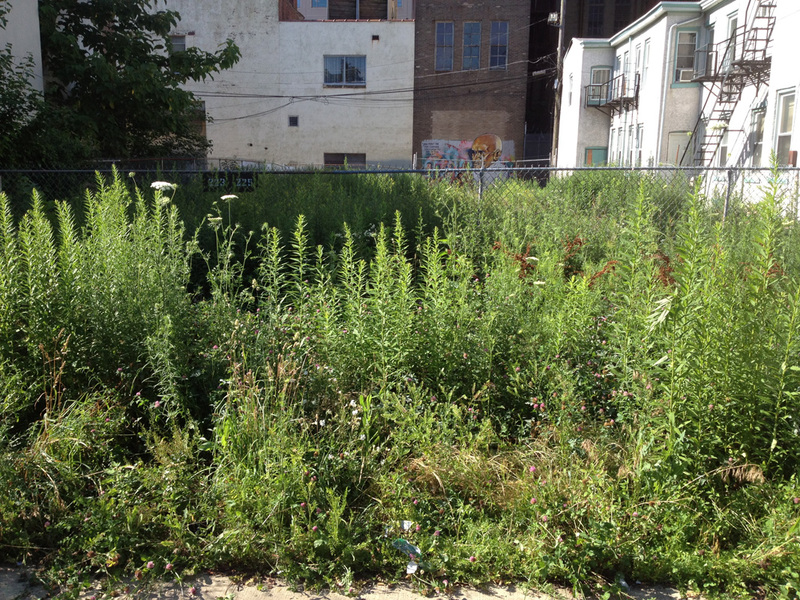 Instead of appealing to the city of Trenton to create a garden on a city-owned lot, they evaded the traditional route and simply took on the responsibility themselves. The Gandhi Garden creators are aware that the City of Trenton could reclaim the lot at any moment, but luckily, the city and local politicians are supportive of the Gandhi Garden. When the Gandhi Garden opened, it allowed the lot to become an extension of the S.A.G.E. Coalition studio. Suddenly exhibition openings could extend outside, and they had a venue to host performances. The concert venue has hosted two plays: “The Aliens” performed by Pulse Theater and “Stoop Theatre” performed by Passage Theater Company. 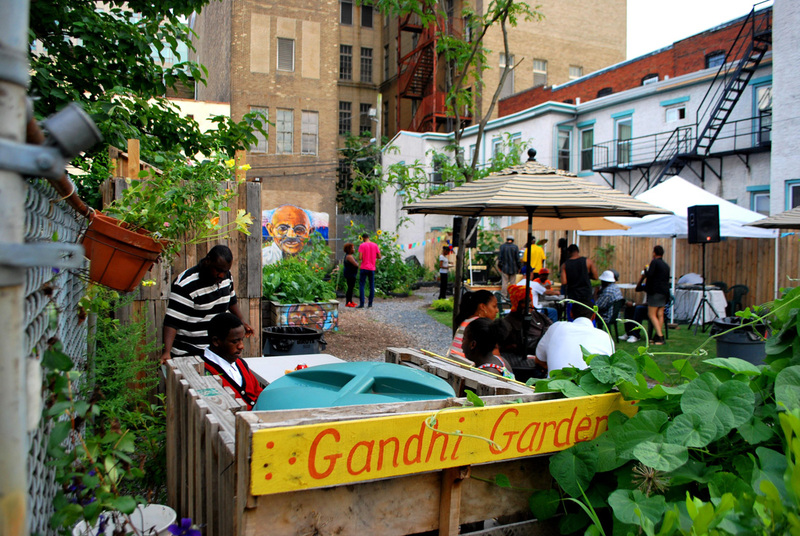 These events and performances are establishing the Gandhi Garden as a community-forming public space and challenging negative perceptions of their neighborhood. As an assimilated part of the studio, it was only a matter of time before more artwork appeared in the Gandhi Garden. Most of the art is by local artists or one of the S.A.G.E. Coalition members, and the majority of it is made using recycled materials. Recycled materials became integral to the garden from the beginning, when 300 illegally-discarded tires had been dumped on the property were uncovered. 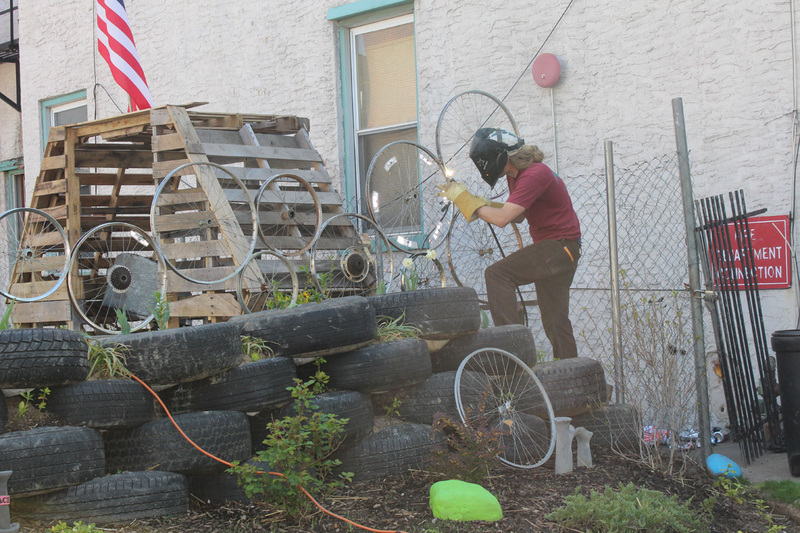 Instead of disposing of the tires, they were repurposed as planters, pathways and gates. In an effort to make the garden more welcoming to the community, the garden is open twenty-four hours a day, seven days a week. The garden only has a small space dedicated to a vegetable garden. 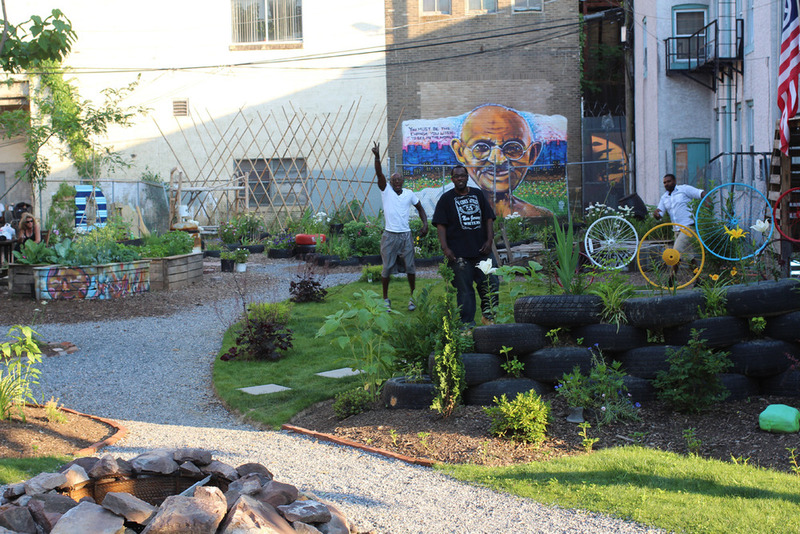 There are numerous other local gardens dedicated to food production, but the Gandhi Garden creates sense of community through neighborhood beautification and engagement. The garden is still primarily run by the S.A.G.E. Coalition, but they are in constant collaboration with a large number of local organizations and neighborhood volunteers who help maintain the garden. The Gandhi Garden’s continued collaboration with other nonprofits in the area, such as ISLES, the Trenton Downtown Association, and A Better Way, will help the garden grow in new and exciting ways. -Story written by Ashlie Flood, Smithsonian Gardens 2014 Katzenberger intern. Entrance to the Gandhi Garden, a community garden and exhibition space in Trenton, New Jersey. Weeds and overgrown grass took over the abandoned lot located next to the S.A.G.E. Coalition Studio. After they finished clearing out the lot, they discovered a mural of Mahatma Gandhi, as well as hundreds of discarded tires. As part of the Gandhi Garden’s design, S.A.G.E. Coalition arranged the abandoned tires into planters and dividers that help direct the flow of the walkways. 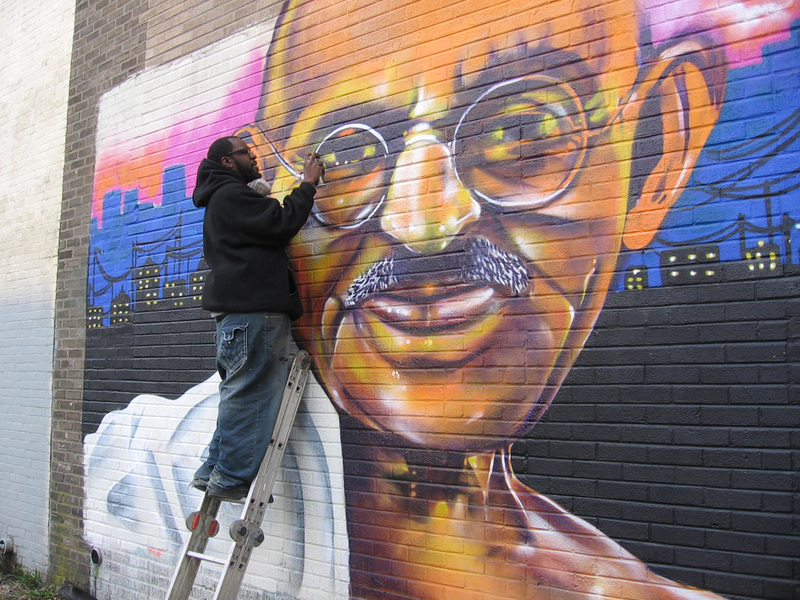 Will “Kasso” Condry paints over the original Gandhi mural with a newer, more vibrant version. A large trellis made from old bike tires by S.A.G.E. Coalition artist Wills Kinsley. 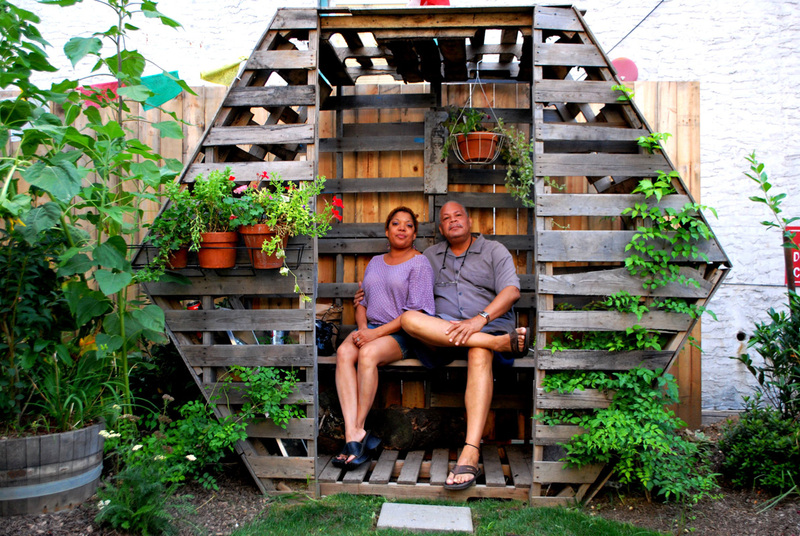 “Honeycomb Hideout,” a hexagonal wooden abode by Peter Abrams, provides the garden with a cool and cozy place to sit. 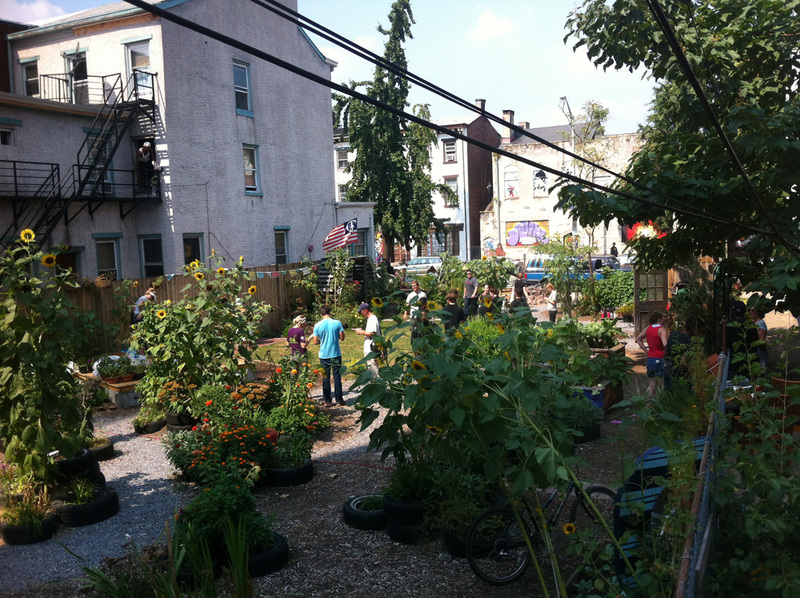 The Gandhi Garden creates sense of community through neighborhood beautification and engagement. The Gandhi Garden frequently hosts parties and events so neighbors can enjoy the serene beauty of the flowers and the atmosphere. 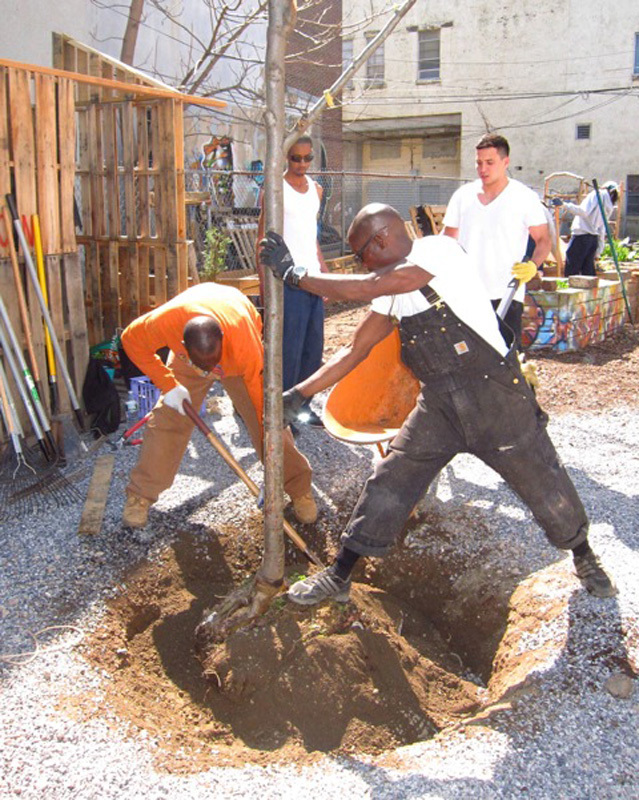 Community members help plant trees during construction of the Gandhi Garden.